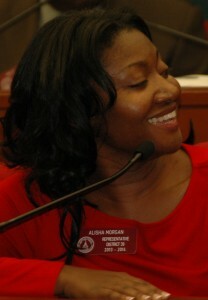 Alisha Morgan makes no secret of her support for charter schools or her affiliation with the pro-charter Black Alliance for Educational Options, noting it in several online biographies. But when she filed her personal financial disclosures with the state ethics commission in 2012, she neglected to mention that the alliance had been paying her. This entry was posted in Charter School, Charter School Amendment, Education in the South, GA Legislature / Laws / O.C.G.A., Georgia Education, Georgia State Board of Education and tagged Alisha Morgan, Georgia State School Superintendent Runoff. Bookmark the permalink. Alisha is genuinely concerned for our children, she is a DFER (Democrats For Ed Reform). She supports non-profit charter schools as a vehicle to improve our state’s education. She is the most qualified and engaged of all the candidates for State School Superintendent. And that us coming from me, who most recently voted (R). She is nothing but a Race Baiter. Let’s substitute “white” for “black” and see how all of the blacks would be screaming that a white candidate was raciest. Georgia primary runoffs are tomorrow, Tuesday 7/22. Since the single largest appropriation in the state budget is education, let’s take a quick look at the two “Republicans” left in the Georgia State Superintendent race. Mike Buck and Richard Woods are both educators and were staunchly against Amendment 1, the charter school amendment. Richard Woods has softened his stance on charter schools and opposes Common Core. Mike Buck appeals to the voters who see Georgia doing a “great job”, is on the course to delivering a “world class education” and agree with him that the Georgia Department of Education needs more bureaucrats.